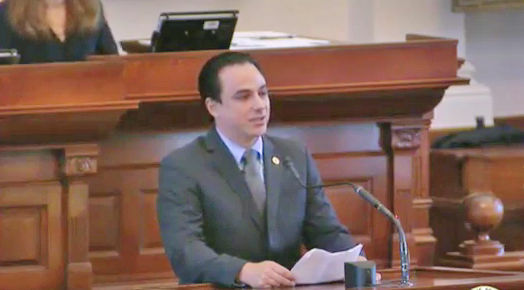 State Rep. Terry Canales, D-Edinburg, delivers a personal privileges speech Thursday in the Texas House Chambers at the state capitol in Austin. AUSTIN — McAllen’s payment to Enrique Iglesias for a 2015 holiday performance may never become public information, and state Rep. Terry Canales is not happy about it. Wednesday night, Sen. Charles Schwertner, R-Georgetown, removed House Bill 349, Canales’ bill, from the Texas Senate’s Local and Consent Calendar. This effectively killed the bill by preventing it from being read on the Senate floor before the end of the legislative session next Monday. The bill reversed a very narrow portion of the Texas Supreme Court’s Boeing Ruling, which was cited when the city of McAllen refused to disclose the price tag for the Iglesias concert. If the bill had passed, it would have wiped out the contract between McAllen and Iglesias, forcing the city to disclose the payment. Prior to the speech, Canales approached Schwertner on the Senate floor, poked him in the shoulder, and said next session he would block every piece of legislation Schwertner authored that was sent to the House. Sen. Juan “Chuy” Hinojosa, who was carrying HB 349 in the Senate, said Schwertner told him he removed the bill from the calendar as retribution for Canales calling a point of order on one of his bills, Senate Bill 11. A point of order is a request to the House Parliamentarian to review that the bill is not breaking any House rules, but can commonly be used as a legislative delay tactic. Canales said he believes Schwertner killed the bill because of its intention to expand government transparency in Texas. Schwertner did not respond to a request for comment. The death of HB 349 leaves no legislation supporting open-government in Texas left standing, according to Kelley Shannon, the executive director of the Freedom of Information Foundation of Texas. In his personal privilege speech, Canales called on legislators to do better when it comes to open-government legislation.